I am really enjoying the cooler weather that we are having in Maryland. The leaves are slowly changing, our windows are open and the air smells clean. I remember hearing, as a kid, grown-ups say, "I can smell Fall in the air." This always seemed like a strange saying to me. As an adult I now know what it means. I walk outside and the first thing I do is inhale a deep long breath of fresh air. The season is changing and it feels wonderful. I went to Whole Foods last week and they have a huge display of squash. I love seeing the varieties with all their own shapes, sizes and colors. My eye was drawn to this bright orange Kuri Squash. The orange is vivid. The shape ranged from round to teardrop. I chose the one pictured above. When I cut into it I was overcome with a flowery scent. I could tell it was a squash but the aroma coming from the Kuri squash was strong. I felt that it would work great with a filling of some kind. I had some left over sausage from an earlier dish and thought it would make a good filling combined with some rice. I made rice, added a few sauteed onions and the sausage. Simply delicious. I scooped the squash pulp and sausage filling onto a platter and served it for lunch. We all thought it was a pleasant change from our favorite Acorn Squash. 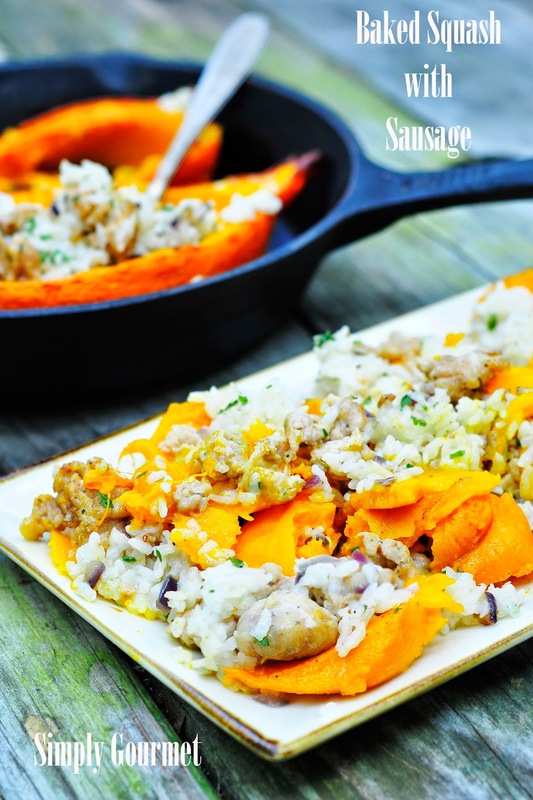 The dish is subtle in flavor with a nice combination of texture from the soft squash, firm sausage pieces and confetti like rice. All in all, a wonderful Fall dish to add to your menu. I hope that you can find Kuri Squash in your area. 2. Prepare squash to be baked by cutting in half, removing seeds and placing in baking dish. Add salt, pepper and 2 tablespoons of butter to each half. The butter will melt and be used when you add the rice/sausage mix. 3. Bake squash for 35 minutes. Check the squash and see if it is still firm, if so, bake a bit longer. 4. While squash is baking prepare the filling. Saute the onion and garlic in olive oil. Add the cooked rice and cooked sausage. Taste mixture and salt and pepper accordingly. 5. 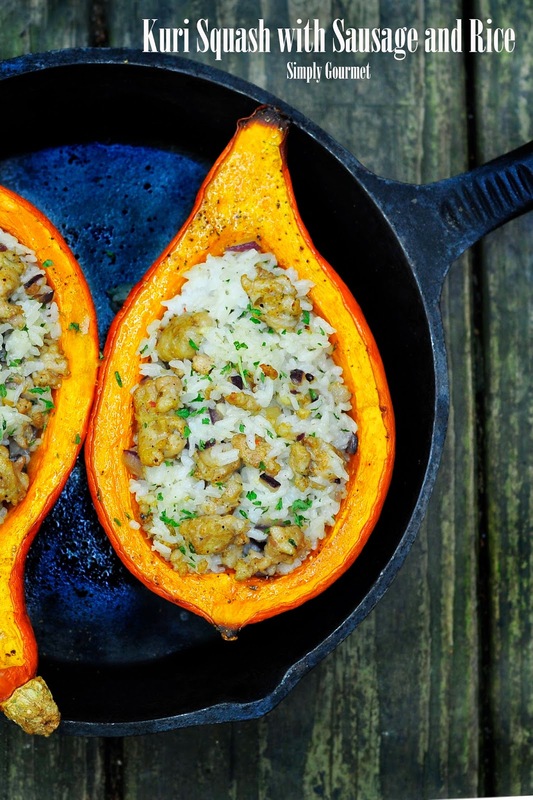 Remove baked squash from oven and fill the centers with the rice. The butter that has melted should be soaked up by the rice. Add the 2 tablespoons of coconut milk and sprinkle with the parsley flakes. 6. Return to oven and bake for 10 minutes. Serve scooped on a platter (see picture) or serve a half to each person.